What can I say? This is an excellent idea that I'm surprised more breweries haven't attempted. Given that Stillwater is known for pushing style boundaries, though, it makes sense for him to put something like this together. Made with sakamai (a rice variety used to create sake) to create a very dry, effervescent "table saison" profile, this is a ludicrously simple and effective concept, and Stillwater's self-conscious package design truly brings this whole thing together. Pours a spectacularly clear, pallid yellow color with a head of pure, consistent white foam. Lace doesn't seem to really happen, but the head absolutely never goes away, no matter how long this sits in the glass... it's a thing of pure beauty, a mark of dedication to the saison style and just exudes pure class. There seems to be some yeast in each can, as pouring more of its contents into my stemmed glass adds some unique haziness and darkens the beer a few SRM. It's still insanely light-colored with a "macro-beer" complexion, but I consider this a win as this was brewed at Two Roads in CT. Nose is phenolic, funky yeast, lemon and grapefruit peel with a starchy and lightly-malty aspect. Simultaneously seems very rustic and intensely clean, which is interesting. Hops seem to be pushed much more than expected with a unique herbal component. Wonder if Sorachi Ace was used for hopping here considering the lemon and herbal elements? Would make sense given what I know of Brian's penchant for thematically-consistent recipe-building. Flavor is delicate and yeast-driven with a dusty, rustic component that nevertheless continues on to a very clean and succinct finish. Earthy, citrusy and light-bodied with that herbal-ness from the nose translating into the finish of each sip. Kind of sage-like with very "green" flavor. Rice starchiness and stiff bitterness form the transition to the finish on this beer. An excellent "session" saison with additional dryness and notes of lemongrass. Feel is, as the beer's name would have you believe, insanely dry with a superbly-effervescent carbonation and light body. The framework of this beer is pure and simple, with every aspect in perfect concert. In my opinion, this couldn't have come out better, and is one of the very best saisons I've had lately. Eminently crushable but with a recipe-driven deftness and enough uniqueness to render it interesting among a sea of fairly normal iterations of the style. Insanely well done. Can purchased at Joe Bean Coffee Bar in Rochester, NY. This one pours a clear straw yellow color, with a small head, and a lot of lacing. Smells wonderful, fresh cut grass, white pepper, lemon rind, spicy and peppery hops, dry white wine, and melon. Wow- it smells really quite great. This is truly one of the best saisons I've ever had. The sake-fying here really does make it exceedingly dry. It finishes bitter and pithy, with lemon rind, sharp grassiness. It's got a very dry white grape/white wine like character, with a nice grassy and spicy hop character, and a yeast character that calls to mind white pepper, and a little bit of clove. It's both simple and immensely complex all at the same time. You could gulp it down and be intensely happy, but you could also sip it slowly and savor all the interesting flavors. This may be the best beer I've had yet from Stillwater, it hit me just right. This is light bodied, incredibly crisp, and finishes dry, and airy. There's a higher level of carbonation. This is insanely well-crafted. I'm actually fairly blown away here. A: Pours a relatively clear pale yellow in color with moderate amounts of fine active visible carbonation rising quickly from the bottom of the glass and some faint straw + pale golden yellow highlights. The beer has a finger tall fizzy foamy bright white head that reduces to a large patch of thin film covering the entire surface of the beer with a medium thick ring at the edges of the glass. Light amounts of lacing are observed. S: Light to moderate aromas of biscuit + bready + rice malts with moderate aromas of grassy/hay, citrus lemon, spicy saison yeast, and earthy hops. T: Upfront there is a light to moderate flavor of biscuit + bready + rice malts with absolutely no sweetness. That is followed by moderate flavors of spicy saison yeast, citrus lemon, and grass + hay. Light flavors of brett with a light to moderate amount of earthy hops which contribute a light amount of bitterness which fades away quickly. M: Light bodied with slightly heavier than moderate amounts of carbonation. Moderate amounts of dryness in the finish. 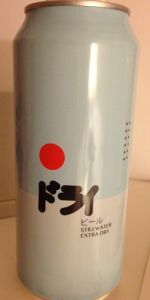 O: Definitely reminds me of a sake and is a very interesting saison. I very much enjoyed this beer and I would definitely have another. I wish I had some sushi to enjoy with this beer. Very refreshing. A thanks to the legendary woodychandler for this beer. Poured from a 16 oz. can. Has a pale golden, slightly white color with a 1 inch head. Smell is of limes, lemons. Taste is citrus, light hops, somewhat dry. Feels medium bodied in the mouth and overall is a unique beer worth trying. I picked up a can of Stillwater's Extra Dry for $2.39 at The Lager Mill. I've been meaning to try this one, so let see how it goes. 2017 Vintage. Poured from a tall 16oz can into a stemless tulip. A- The can looks good, it's got a good design and it's eye catching. It poured a hazy golden yellow color that took on more a pale yellow color when held to the light and it had a little over a two fingers worth of fluffy white head that died down to a thin ring that eventually faded away and it didn't leave much lacing behind. This is a pretty nice looking beer, but I wish it had some better lacing. S- The aroma starts off with a lower amount of sweetness with a nice stone fruit like aroma being the first to show up with some pears seeming to stick out the most and it's followed by the saison yeast which imparts a typical estery and slightly spicy saison yeast like aroma with some citrus rind aromas also showing up. Up next comes the malts which are on the lighter side and impart some light grainy, biscuit, cracker and rice like aromas. This beer has a pretty nice aroma, it lives up to it's description. T- The taste seems to be similar to the aroma and it starts off with a lower amount of sweetness with the stone fruits being the first to show up, but they are much lighter than they were in the aroma and it just imparts a generic stone fruit like taste this time and it's followed by the yeast which is noticeable and it imparts all the same aspects that it did in the aroma, but it's also lighter than it was in the aroma. Towards the end comes the malts which imparts all the same aspects and they show up just about as much as they did in the aroma, On the finish there's a lighter amount of medium bitterness with a bitter and slightly hoppy aftertaste. This is a pretty nice tasting beer, they pretty much nail what they are going for. M- Fairly Smooth, crisp, very dry, on the lighter side of being medium bodied with a medium amount of carbonation. The mouthfeel pretty nice and it works well with this beer. Overall I thought this was a pretty nice beer and it was a nice and unique example of the style, it was pretty much just as described and they weren't playing around when they call this beer extra dry. This beer had ok drinkability, one is enough for me, it's almost too dry for me to drink more than one. What I like the most about this beer is that it lives up to it's name and description, it's just as described. What I like the least about this beer is the drinkability, I wish it was a little more drinkable. I'm not sure I would buy this beer again since, I don't normally like my beers this dry and I would only recommend it to someone who wants a beer that's pretty dry. All in all Liked this beer, but i didn't love, but that doesn't take away from the fact that Stillwater nailed what they were going for. It's not a favorite Stillwater beer and it's a nice and unique example of the style. Nice job guys, this is one unique take on a saison, keep it up. 16 ounce can into tulip glass, canned on 5/16/2016. Pours slightly hazy golden straw color with a 2 finger foamy and fluffy white head with good retention, that reduces to a small cap that lingers. Light spotty soapy lacing clings around the glass, with a fair amount of streaming carbonation. Aromas of big lemon, peach, pear, apple, orange peel, white wine, grapefruit, peppercorn, rice, white bread, herbal, floral, grass, and yeast earthiness. Very nice aromas with good balance and complexity of fruity/spicy yeast, citrus/earthy hops, and light pale malt notes; with great strength. Taste of big lemon, peach, pear, apple, orange peel, white wine, grapefruit, peppercorn, rice, white bread, herbal, floral, grass, and yeast earthiness. Large amount of peppery yeast spiciness and citrus rind bitterness on the finish; with lingering notes of lemon/orange rind, peach, pear, apple, white wine, grapefruit, peppercorn, herbal, floral, grass, and yeast earthiness on the finish for a while. Very nice complexity, robustness, and balance of fruity/spicy yeast, citrus/earthy hops, and light pale malt flavors; with with minimal lingering hop astringency after the finish. Medium-high carbonation and light body; with a very smooth, crisp, dry, and fairly sticky/resinous mouthfeel that is nice. Zero warming alcohol as expected of 4.2%. Overall this is a very nice and unique saison. All around nice complexity, robustness, and balance of fruity/spicy yeast, citrus/earthy hops, and light pale malt flavors; very smooth, crisp, and refreshing to drink. This was pretty aggressive on bitterness, but wasn’t astringent due to the very crisp and dry finish. A very enjoyable offering. Soft Belgian yeasts and prickly pear flavor dominates the taste. Aptly enough, it's dry and crisp. Ample carbonation that lingers on your tongue past the sip. Wonderfully crafted brew that's highly refreshing.